The lives of thousands of vulnerable children could be transformed if they were able to go to boarding school, a leading head teacher will say later. Melvyn Roffe, head of the Boarding Schools Association, believes those at risk of being taken into care could gain most from the stability offered. But he will tell its annual conference "ignorance and prejudice" within local councils means many children miss out. Mr Roffe also says ministers could encourage boarding through grants. Mr Roffe, who is the principal of Wymondham College, a state day and boarding school in Norfolk, will deliver a speech to the BSA's conference in Thame, Oxfordshire. He will say: "We know that up and down the country there are hundreds, if not thousands, of children whose life chances would be transformed by having a place at boarding school." 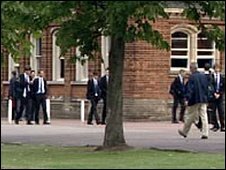 He will say that, despite some good work by the Department for Children, Schools and Families and some local authorities, "there remain too many people in the system who reject on the basis of ignorance or prejudice the very idea that a child might thrive at a boarding school". He will add: "We know that boarding school isn't the answer for every vulnerable child... but it could be the answer for a whole lot more," he will say. Mr Roffe will tell delegates that 70 boarding schools offered to take part in the government's pilot Boarding Pathfinder Scheme, which was designed to help vulnerable children attend boarding schools. But an independent evaluation of the initiative found that while 76 young people were identified in the 10 local authorities that took part, most were eventually deemed unsuitable. Of the 17 who were given a place, only 11 were still there at the beginning of this school year. Mr Roffe will argue that far more boarding schools would take part if the scheme was developed and local authorities did more to facilitate it. Mr Roffe wants ministers to commit to paying a grant to every child from a vulnerable background who gains a place at a boarding school. That money could be used to pay the boarding fee at a state boarding school, or be combined with existing bursaries and grants from charitable trusts to allow a child to attend a private boarding school. If 1,000 children were eligible, the scheme would cost about £10m - a "drop in the ocean", Mr Roffe will say, compared with public spending on social care.